Hirsch Perlman's photographs are created in the spirit of 19th Century experiment and discovery. 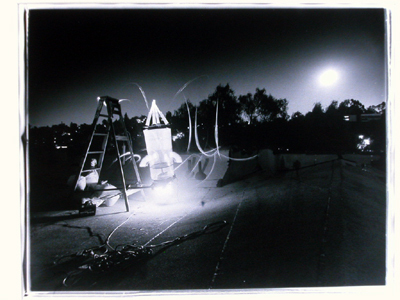 Black and white images taken at night depict homemade rockets awaiting their launch from the roof of the artist's Los Angeles home. Having built these strange contraptions from household objects Perlman creates a ghostly and spiritual aura through the use of long exposure times. The images crackle with light flashes creating a heightened sense of expectation. The flashpoints of cables and translucent tubes and cones are contrasted by the surrounding darkness and against this anticipation is a quieter mood of romanticism. Peering into the darkness it is possible to discern not only the city skyline but also the artist himself. At times Perlman's shadowy figure is almost imperceptible, the slow exposure of the images giving his presence a ghostly quality, at other moments his opaque body itself becomes alien, illuminated in a single beam of light. A Victorian sensibility of the supernatural and otherworldliness is captured in these photographs, their simplicity and starkness belying their complexity. The darkness and light in Perlman's artwork make confounding contradictions. They are at once full of calm solitude and frenetic isolation. Anxiety creeps up in these photographs quietly. The initial thrill of space rockets and the exploration of outer space is replaced by a more uneasy concern. Are these rockets vehicles for space exploration or weapons? Another photographic series depicts deflated beach balls and clusters of Christmas lights. Still lives that resemble on the one hand deep-sea creatures or cellular structures but on the other recall explosions captured in a single moment, at once still and terrifying. These shapes are reminiscent of the all-destroying mushroom clouds signifying the end of everything. Attempting to create rockets out of ephemeral materials in an age of high technology might seem like a contradictory activity, but underlines a pre existing anxiety within society. Keeping guard over his creations Perlman acted as a night watchman, making sure that all would be safe until morning. This is Hirsch Perlman's first exhibition at Gimpel Fils, and he will be available for interview on Friday 21 and Sunday 23 October. He has exhibited internationally in numerous solo and group exhibitions including: 'Incommunicado' at the Hayward Gallery, London, 2003 (group), and 'Projects 54' at Museum of Modern Art, New York, 1996 (solo). Some places exist. Seems undeniable. The question is where and how. Perhaps it is the quiet shadowy spaces that get overlooked that we should be interested in. Questioning the nature and form of contemporary sculpture and the environments in which it is seen, Gedi Sibony places his works on the floor and hangs them from the walls. Made from flimsy card, odd carpet shapes, found sticks, foam and packing tape, these works have an air of improvisation about them, but each component is planned and precise. Hints of sadness as well as humour become surprisingly evocative. Gedi Sibony's work has been described as 'so graceful it appears to have been choreographed rather than constructed'. Individual elements intricately related to each other to cohere into a startling whole. Sibony often utilises the gallery walls, making marks that interact with the gallery space and with each other. In this almost ethereal environment, a stage for possibility, tentative and audacious moves unveil themselves to tease the nature of art, its pleasures and the aesthetic experiences it provides. There is optimism in Sibony's artworks, the suggestion that beauty can be found in simple ordinary materials that are normally discarded or considered utilitarian. Strangely fragile works are cobbled together from such materials as sticks, old carpet and cardboard boxes. And the shifts around and between them, in their careful arrangement, activate the place, and exist. Artist Gedi Sibony was born in New York City and received his Masters of Fine Arts from Columbia University. He had his first solo exhibition in 2004 at Canada, NYC, and in the summer of 2005 was included in a number of prestigious exhibitions including Make it Now: New Sculpture in New York, at SculptureCenter, and Greater New York 2005, PS1, both Long Island City, NY. This is Sibony's first exhibition in the United Kingdom. The Lower Gallery exhibition programme at Gimpel Fils was initiated in November 2004 dedicated to promoting young and emerging artists. Gedi Sibony's exhibition is the sixth in the Lower Gallery programme.